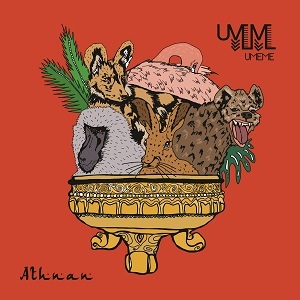 Umeme latest ep “Athnan” reflects the focus of Daniele Labbate and Bas Bouma on producing a crossover between North African rhythms, analog synths and drummachines. Like the previous one, this ep is entirely performed and recorded live at Umeme’s studio dividing the work between Bas Bouma who took care drums and percussion and Daniele Labbate responsible for the synthesizers and other harmonic instruments. While the previous album “Afrorave” was a dark and flashy mix of different styles and rhythms coming from of Togo, Ghana, Ethiopia “Athnan” instead concentrates exclusively on Maghreb and Sharqi music originally from Morocco, Algeria and Egypt. The album is released on 339 records. Mixed and mastered by Italian producer Marco Spaventi. Korean artist Da-In designed the artwork.